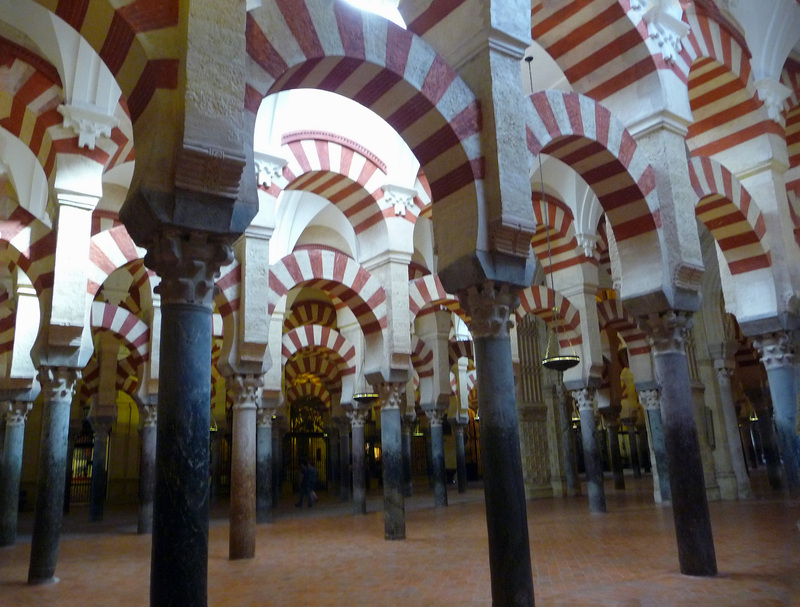 Once the centre of worship in Western Islam, the Mesquita in Cordoba, Spain, with its glorious exterior golden walls, is considered one of the architectural wonders of the world. Red and white striped arches as far as the eye can see, each one seemingly different, create patterns that leave one enchanted. More bizarre however, is the Catholic Church plonked down in the centre of the mosque, something which alone qualifies it as a most unusual place. Originally built on the site of the Basilica of St Vincent the Martyr, a 6th century Visigothic church, then becoming a mosque and latterly a church (in use today) one can look down on the remains of the earlier building through a glass panel set in the floor, reminding us that this edifice has been owned and operated by 3 religious houses at different times. 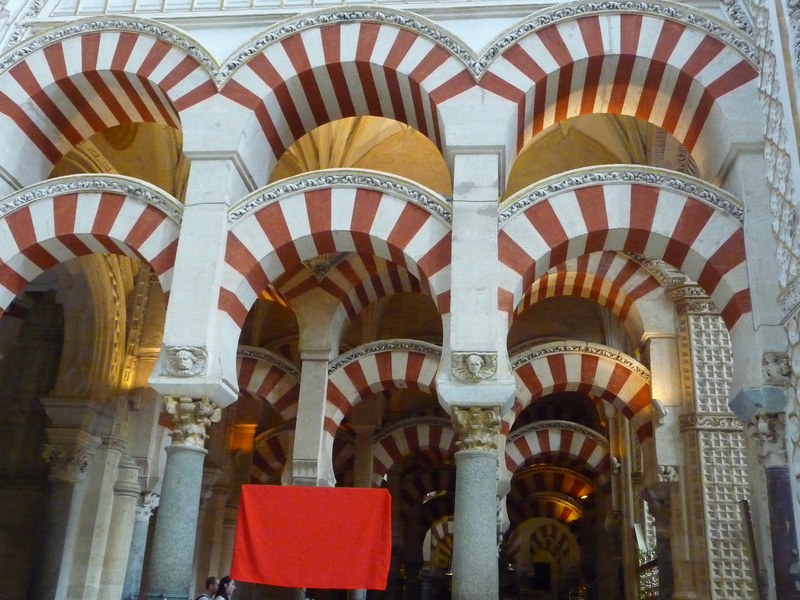 From 785 when the Caliphate was powerful in the Iberian peninsula until the sack of the Moors in the 13th century, the Mesquita grew grander and larger under each succeeding Caliph but during all that time, all religions lived side by side in harmony, each sharing their knowledge of geometry, philosophy, algebra and other intellectual disciplines. 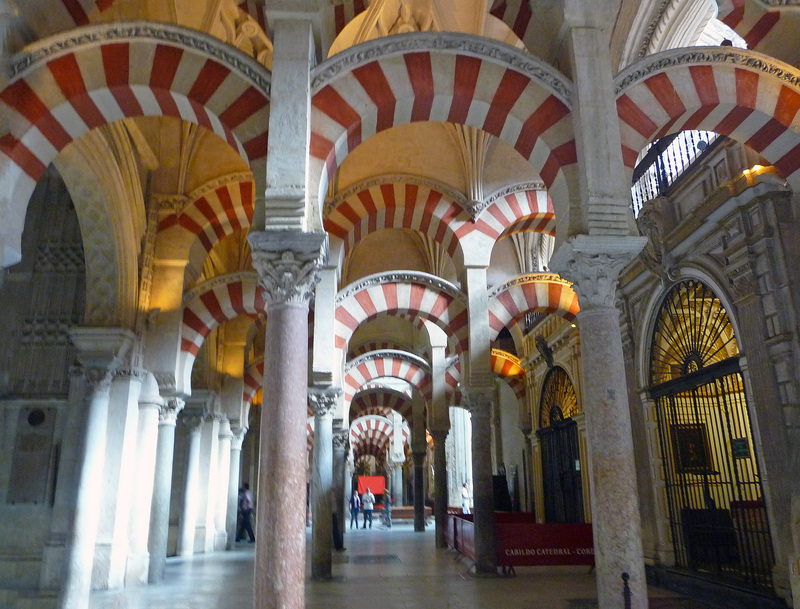 Caliph Abderramán 1 built the great hall in which there are 110 columns the capitals of which came from old Roman and Byzantine buildings Above this there is a second row of arches which creates a wonderful effect. 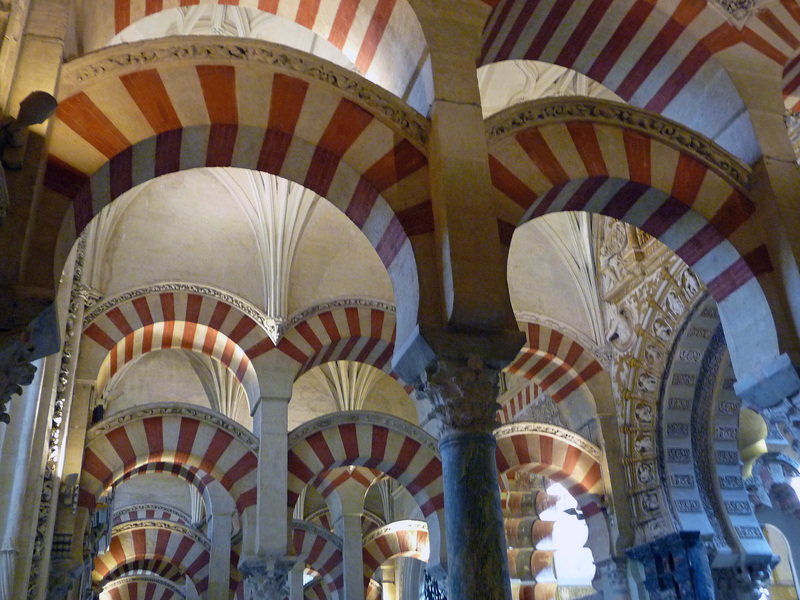 Eight more arches were added in 833 by Abderramán II, the minaret, Mahrab and the Kliba in 962 by Alakem II. The mosque was doubled in size in 987 when Caliph Alamanzor added blue and red marble pillars and today the total of these endeavours is truly wondrous. It is our good luck that the Christian conquerors didn’t destroy this magnificent building as they did so many others, but choose to place their church, consecrated in 1236, inside the walls of the mosque. This bizarre placing of one religious house inside another is just one of the things that makes the Cordoba Mezquita so unusual. Against the austerity of the pillars of the mosque, the chapels full of gold and silver decoration, statues of the Madonna, marble-swathed tombs and heavy wooden carved choirster stalls, stand out defiantly but somehow, the spellbinding beauty and simplicity of the arches puts the flamboyance of the christian church in the shade. What a fascinating, informative article – to think this all started more than a thousand years ago. The photography is stunning. Thanks Jan, your comments make me want to improve.